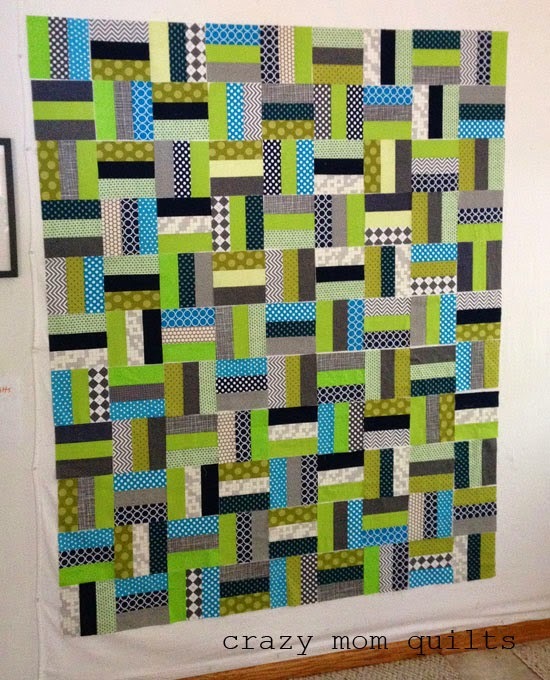 I finished my rail fence quilt last Tuesday when I had a few uninterrupted hours of sewing time. (It was such a treat!) I'm very happy with how my quilt turned out, but more importantly my boys gave it their seal of approval. Not that it's a tough sell or anything, but still, good to know! The "deadline" is August 1, 2014 if you'd like your name thrown into the hat for prizes. 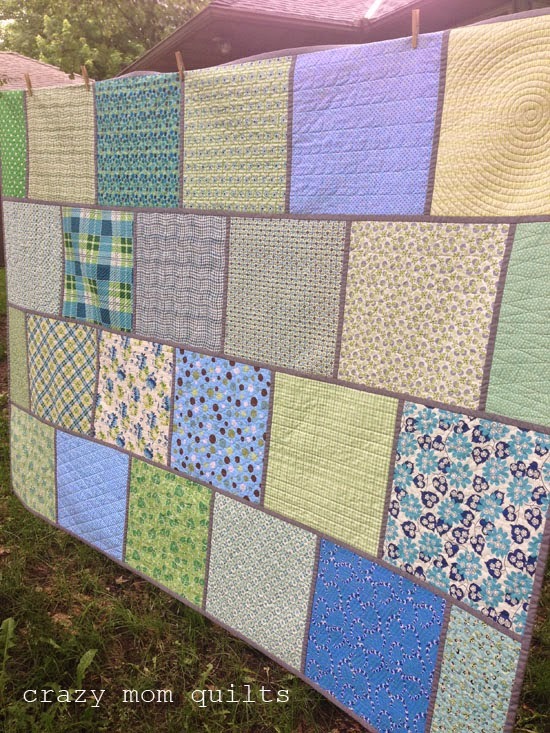 One prize per every 20 quilts donated. If you are donating a boys' quilt, your name will be thrown into the hat twice. 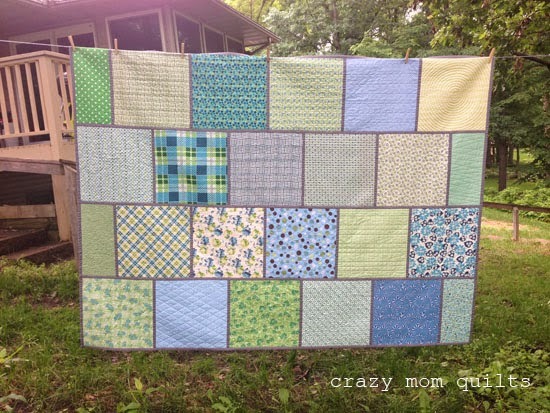 It can be any type of quilt, it doesn't need to be a rail fence quilt as shown here. If you are looking for other ideas, there are bunch on this page. Aim for a finished size of 50" x 60". Now, it's your turn! 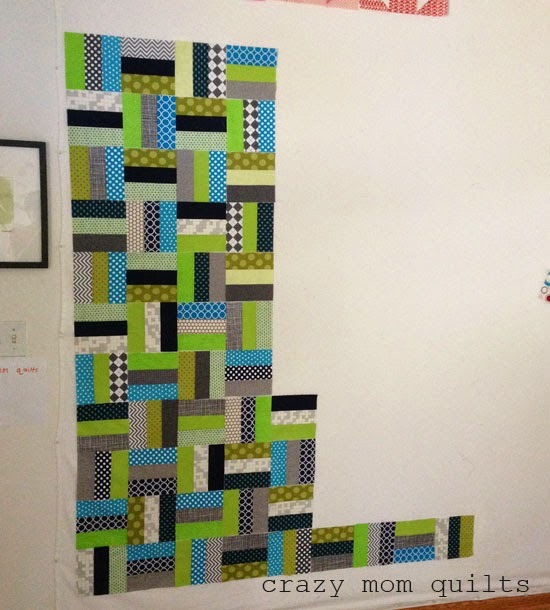 If you are quilting along with me, I'd love to see your progress! Please link up so all of us can see your progress/finished quilt. I will leave the linky open until August 1, so even if you don't have progress to share at this time, you can still link up when you are ready. Welcome to finish it up Friday! I'm so pleased to have a finished garment to share today! 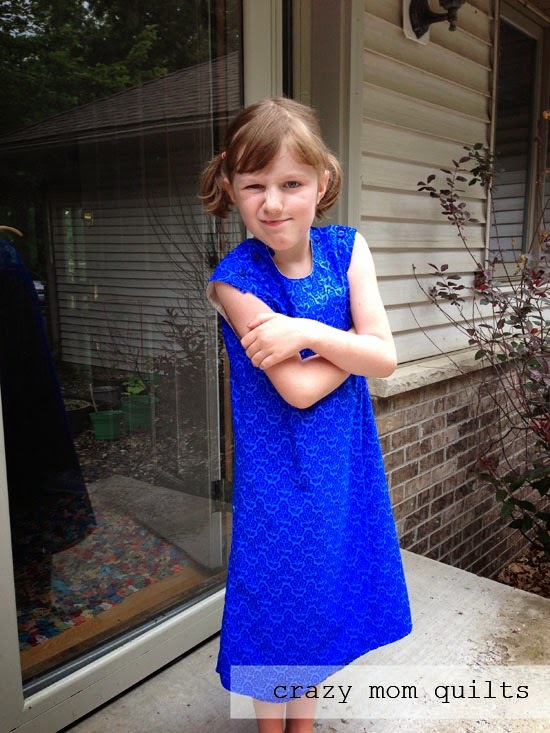 It was hard to pick a fabric that both my daughter and I agreed upon. 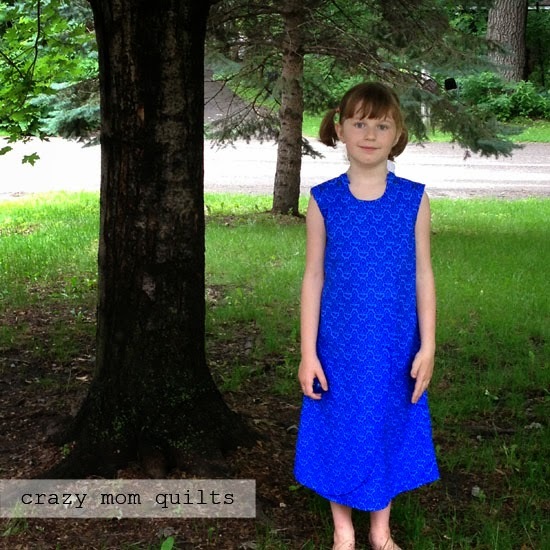 I wasn't crazy about her choice (and I wasn't sure that I wanted that many scraps of this fabric left over-hahaha!) but I gave up control and in the end I think it worked out well! I can pick out quilt fabric all day long. Picking out fabric for garments is a completely different story. 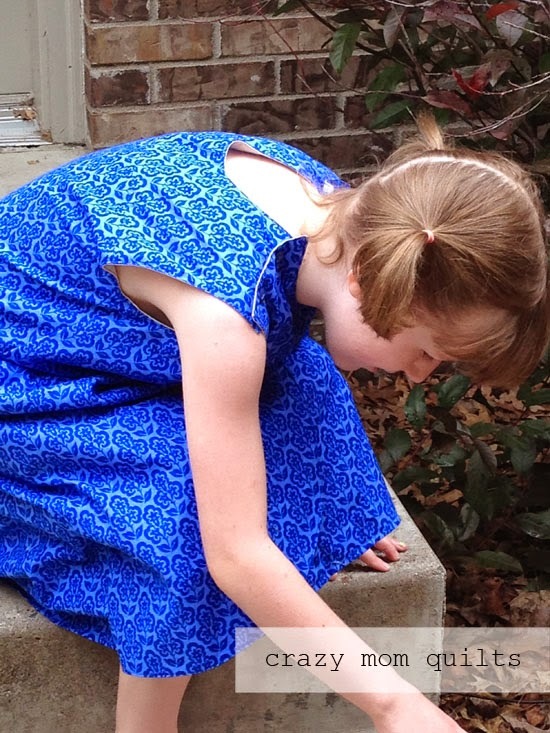 This photo is proof that you can still chase bugs even if you are wearing a dress! Good to know, right? 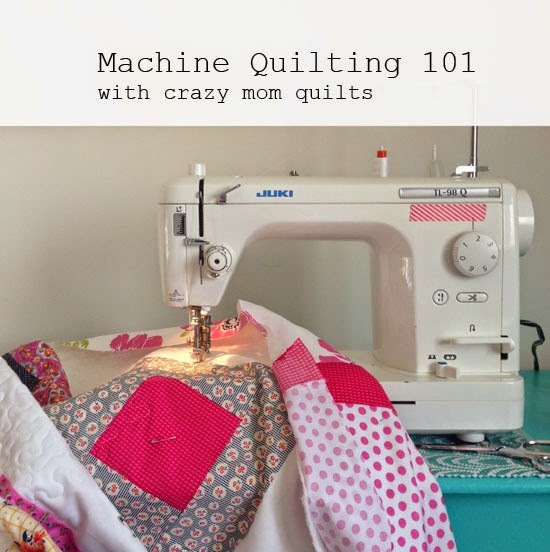 We are up to week 6 in the Machine Quilting 101 Series! I'm very excited about today's post! 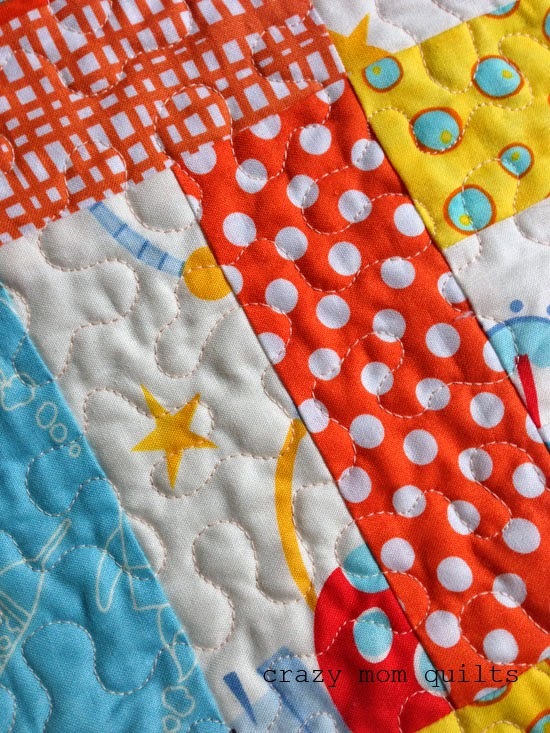 Today we will be talking about how to pick a quilting pattern for your quilt. 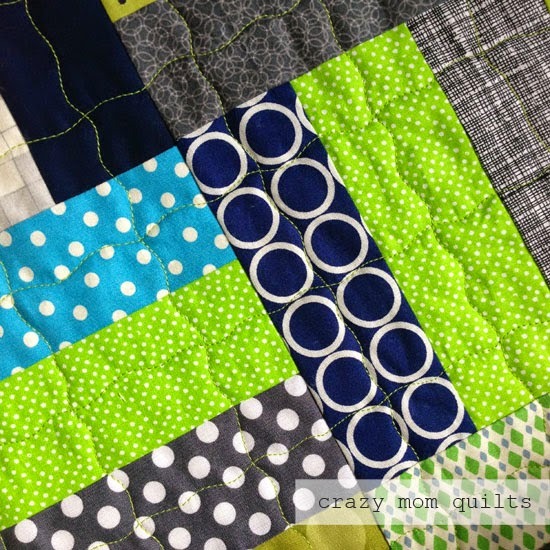 You've probably heard the phrase "quilting makes the quilt". No pressure at all, huh? I've been machine quilting for over 11 years and I have to admit that I STILL get nervous when I begin quilting a new quilt. Yes, every single time, because I don't want to mess it up! The main thing to consider when picking a pattern is what is your comfort level vs. the risk. 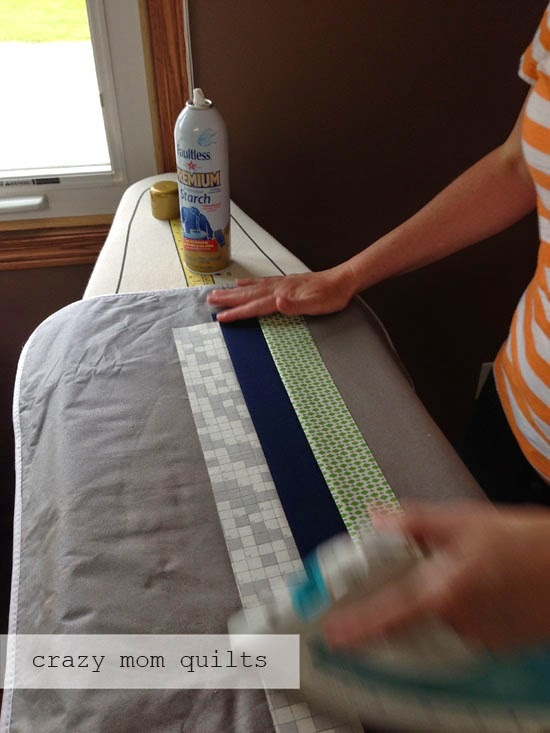 If you are trying a new-to-you technique, it's best to practice on a quilt that will be for one of your kids/grand kids, maybe a picnic quilt, or a quilt that will live on the back of your couch. Something low risk. 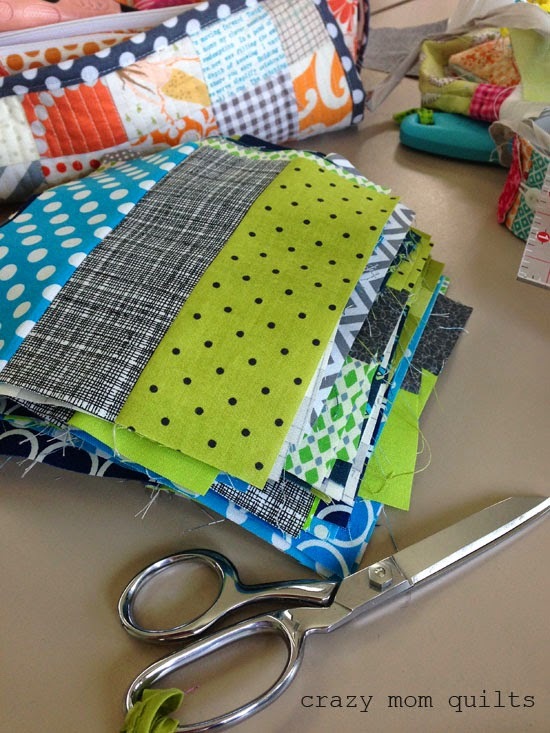 If you are entering your quilt into the fair, submitting it to a book or magazine, the risk is a higher, so you probably want to stick with a pattern that is within your comfort level. Not to sound like a broken record, but don't underestimate the power of practice. 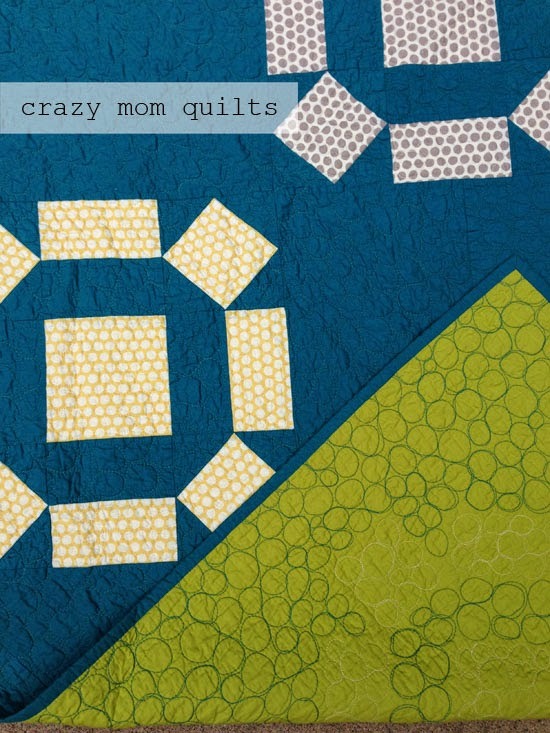 Start small and work your way up to a larger quilt. For example, when I was learning how to machine bind quilts, I started by binding doll quilts and I worked my way up to a lap quilt. 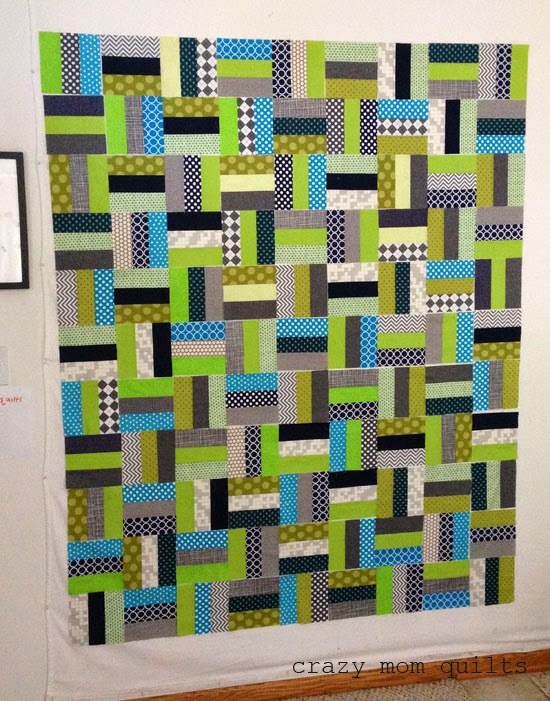 The first quilt that I bound completely by machine was for my son, who didn't really care if the top stitching was crooked in places and a little wonky around the corners. (And it was.) 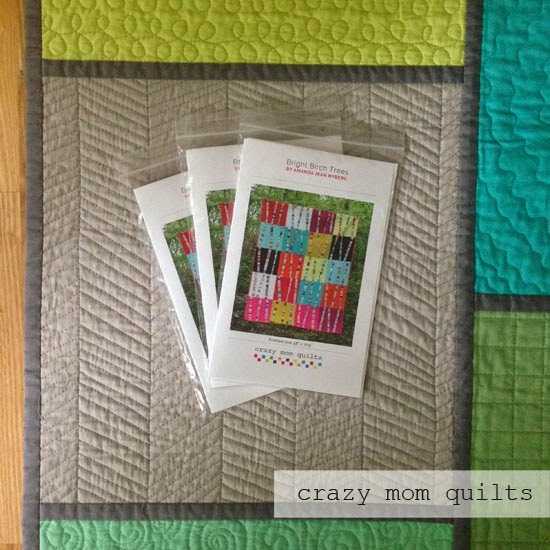 Eventually, I machine bound a quilt that ended up on the cover of Quilty Magazine, and I wasn't nervous at all about the quality of my stitches. Practice really does help! 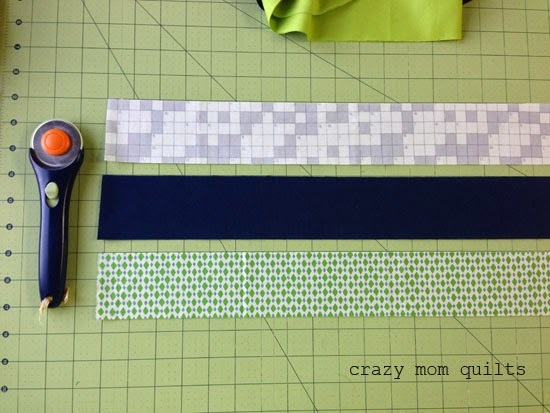 When picking a quilting pattern for a quilt, there isn't one right answer. 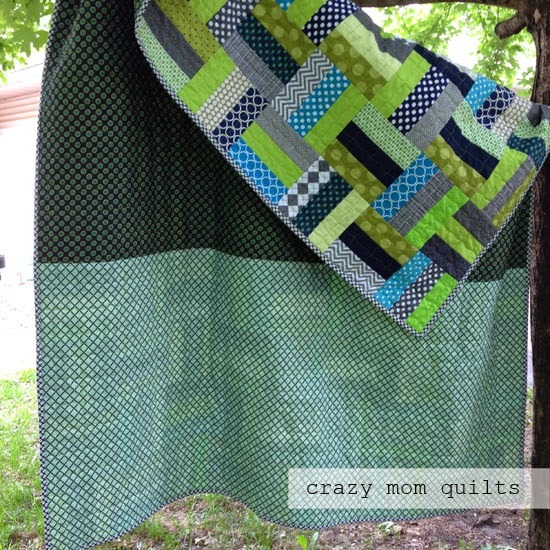 I'll show some examples of what I've quilted and try to break down why I chose that pattern for that quilt. Hopefully I can convey my thought process a little bit. Sometimes all you need is something to hold all the layers together. 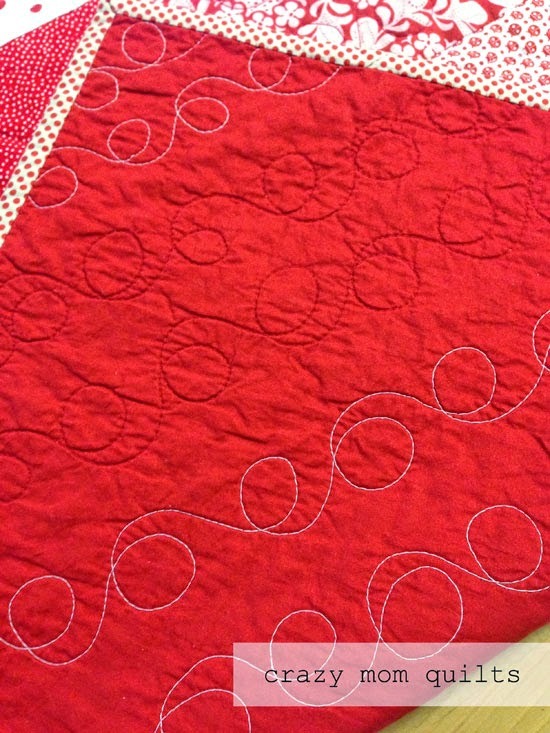 A stipple or loop-de-loop is a good solution for so many quilts. 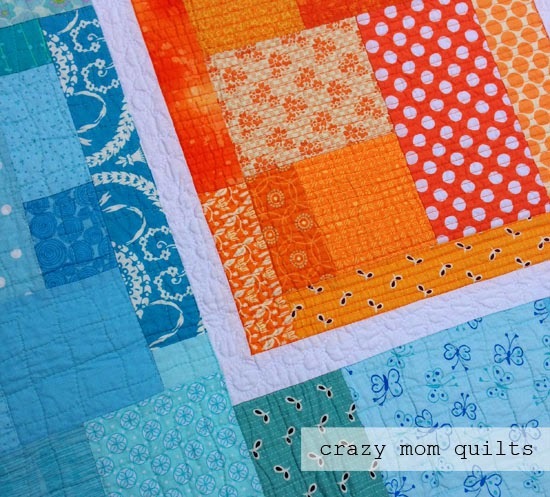 I've done a lot of this in my day, and I love how it adds texture to a quilt. A lot of my quilts are simple designs that celebrate pretty fabric, so a meander of some sort works beautifully on this type of quilt. 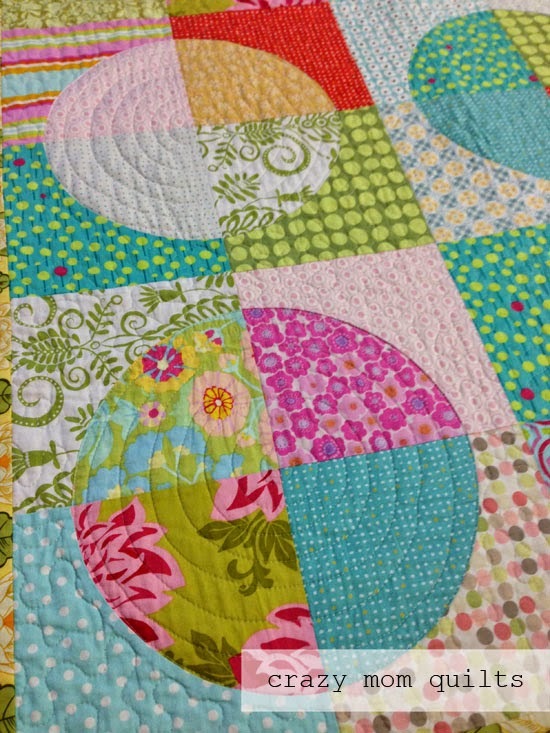 On this patchwork quilt, I quilted loops down the center of each row, eyeballing the line of stitching down the middle. The squares finish at 2.5", so one line of stitching is enough. I chose this pattern because I knew it would be quick and easy, plus it was a nice alternative to my usual stippling or loops. This quilt has larger patchwork, with squares that finish at 4", so I did two lines of loopy stitching down each line of patchwork. I like how the stitching shows up more in some squares-like the solids- and how it is camouflaged in some of the printed squares. I was still able to eyeball the placement, so no marking was required. That's always a bonus! On my trees! quilt, I did an all over loop-de-loop pattern because it reminded me of tangled Christmas lights....to go along with the Christmas tree theme. 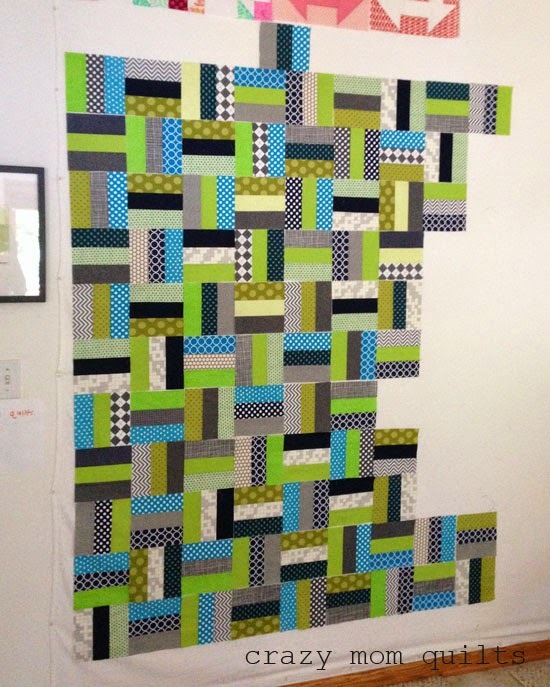 Since the trees are so linear, I wanted the quilting to soften the hard lines of the piecing. Contrast is good! 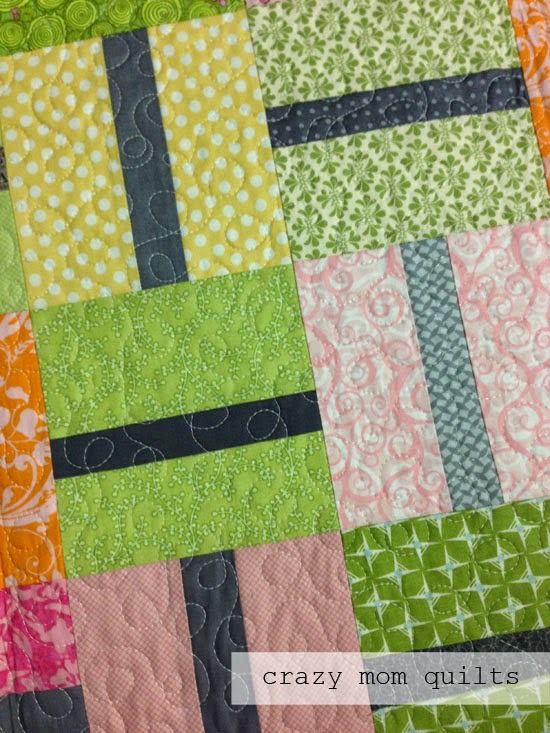 On my plain spoken quilt, the quilting is a major component of the overall design of the quilt. (Pattern is Plain Spoken from the book The Modern Quilt Workshop by Weeks Ringle and Bill Kerr.) 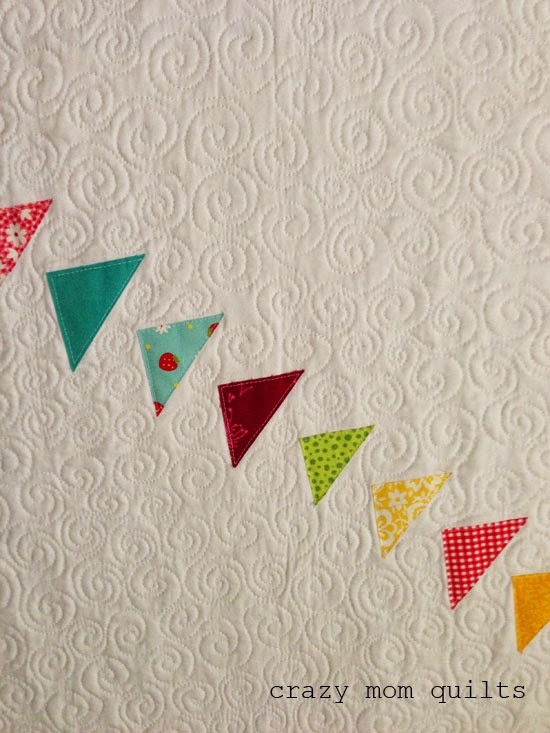 The elongated stippling is curvy, which again contrasts nicely with the hard lines of the patchwork. On the Up, Up and Away quilt (pattern in Sunday Morning Quilts) the squares finish at 2" and I was afraid stippling would feel kind of chaotic. I quilted it with straight lines to keep things simple and clean. 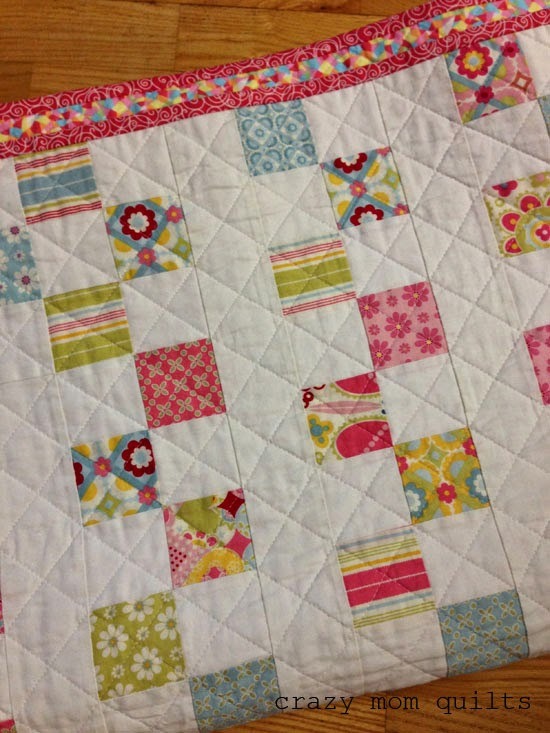 The patchwork acted as a guide for quilting and I chose to only quilt through every other block. It seems to be a nice compliment to the tiny patchwork. I chose to quilt a diagonal grid on my round and round quilt, mainly because of the size of patchwork (another 2" square) and the amount of white in the quilt. No extra marking was required. Yes, it's a running theme because it's so important! All the negative space shows off the classic grid quite well. In these two quilts (running in circles above and crop circles below) I used the same quilting treatment....spirals for the circles and stippling for the background. 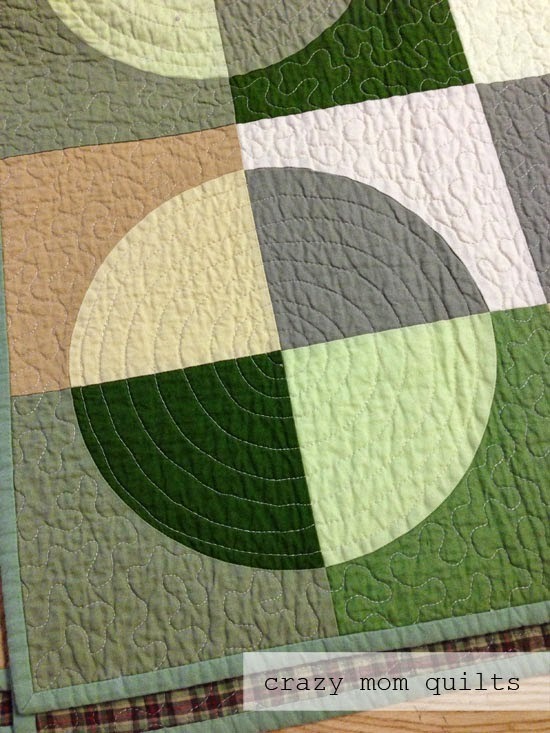 This helps define the patchwork and highlights the curved piecing. If you are going to go through the work of piecing curves, why not show it off? Choosing a thread color is a whole other topic that I plan to dig into deeper on another day, but I will touch very briefly on it today. Sometimes it's hard to pick a quilting design that works with just one color of thread, so occasionally two thread colors (or more) is the answer. 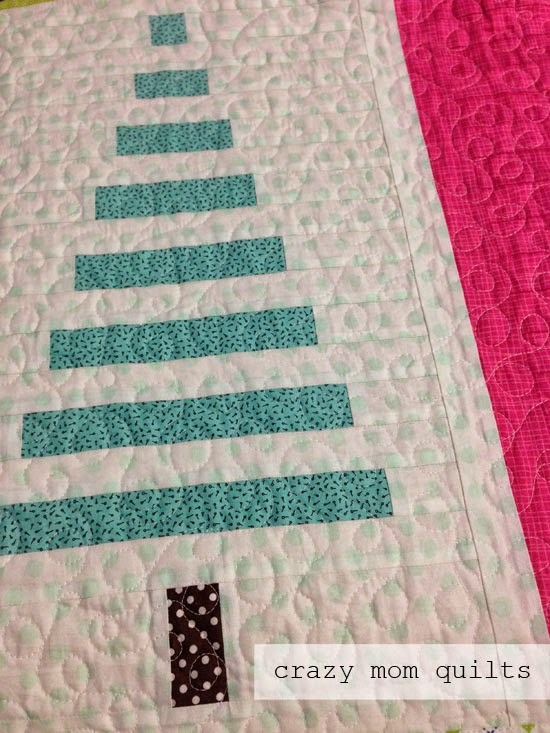 For my candy cane quilt, I quilted lines of loops that follow the patchwork. 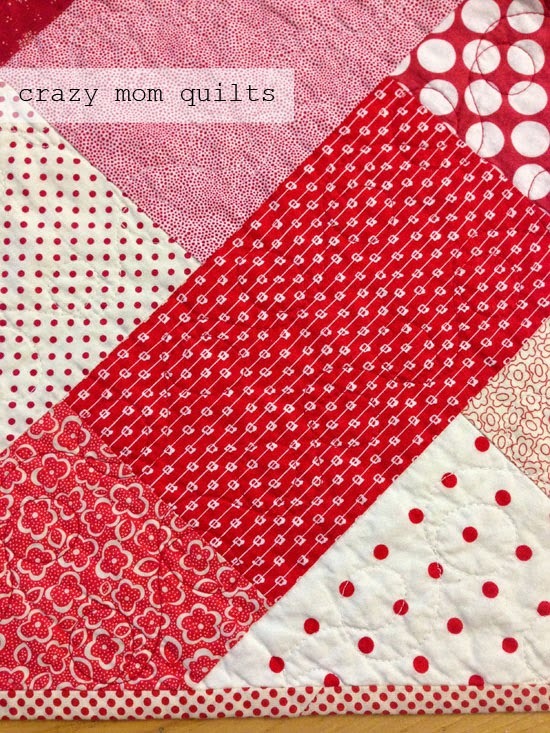 I wasn't very confident in my quilting abilities at the time, so I was nervous to quilt with red thread on the white patchwork and vice versa. 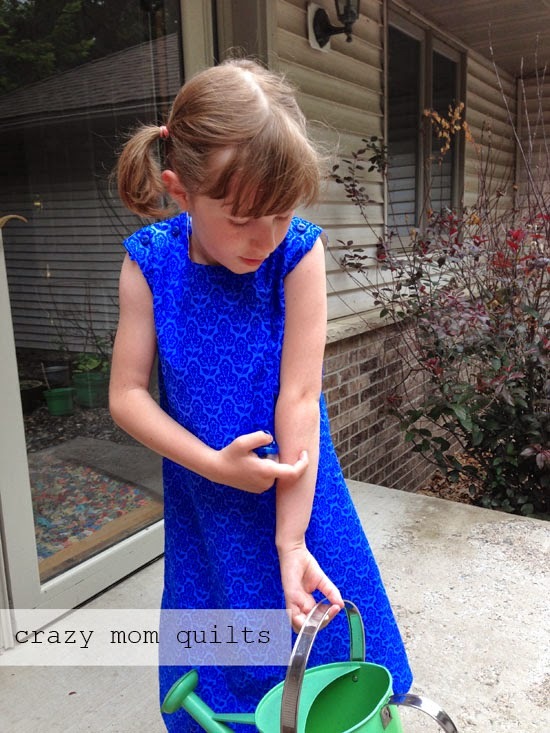 Matching the color of thread to the color of patchwork was a great solution. It formed a really cool design on the solid backing! This was a happy accident. I had a hard time deciding how to quilt my rolling stones quilt, mainly because of the stark color contrast between the blocks and the background color. I finally settled on a pebble quilting design and two different colors of thread. It was a boatload of work to pebble quilt this thing (it's a large twin size) but I definitely made the right decisions all around. Pebble quilting....rolling stone pattern. It was a pairing that was just too good to pass up! 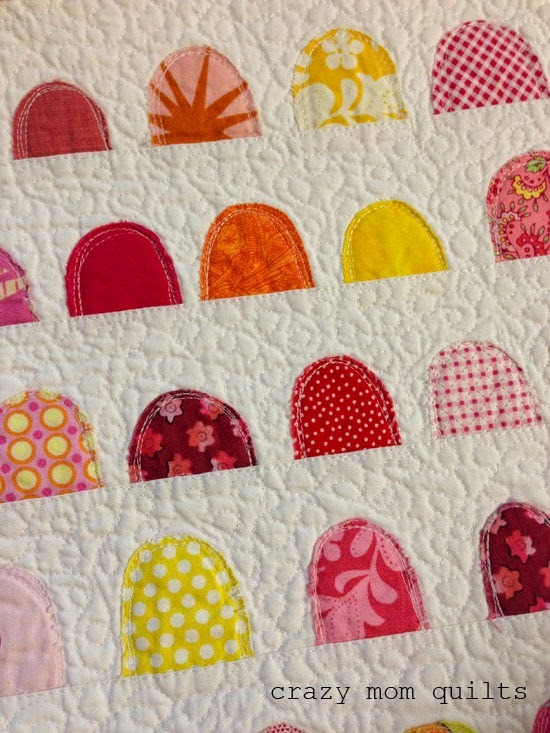 On my Gumdrops quilt (also from Sunday Morning Quilts) I quilted over the gumdrops to help secure them in place. (I used fusible web, but I didn't trust it completely, so I quilted them individually, just to be sure.) Once I had the gumdrops quilted, the background puffed out in an unattractive manner, so I filled in the background with teeny tiny loops and meandering. 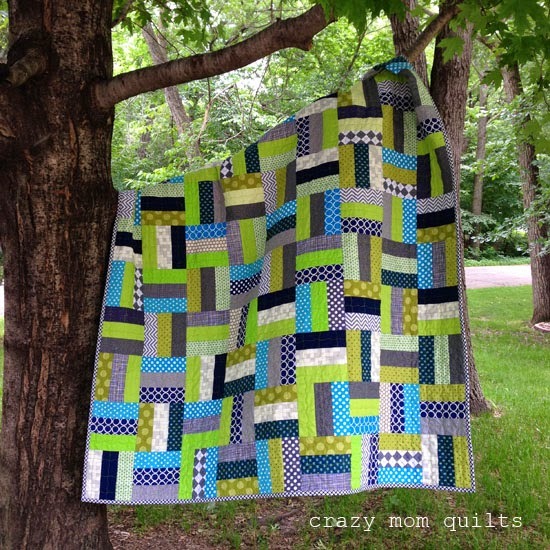 I wasn't planning on it, but the quilt needed it! That happens sometimes. On my migration quilt the applique is quite minimal, so the negative space required some special treatment. I chose the swirls because they reminded me of a windy day...fall....migration. It's all a part of the theme. I wasn't very confident in my swirls when I started but I got a lot of practice and was quite proficient by the end! 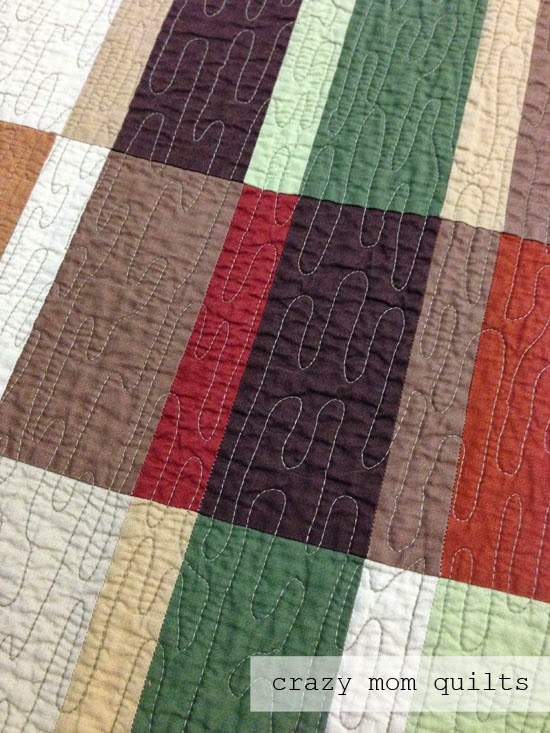 My rainbow log cabin quilt is another good example of the importance of quilting the negative space. I quilted a petal shape in the gray areas and it adds a lot to the overall finished quilt. 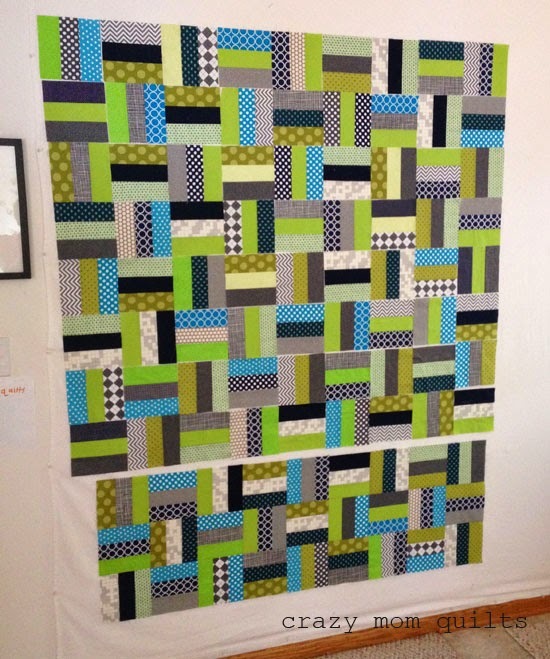 It contrasts the linear quilting in the center blocks and makes the borders pop. I hope that you've found this post helpful. 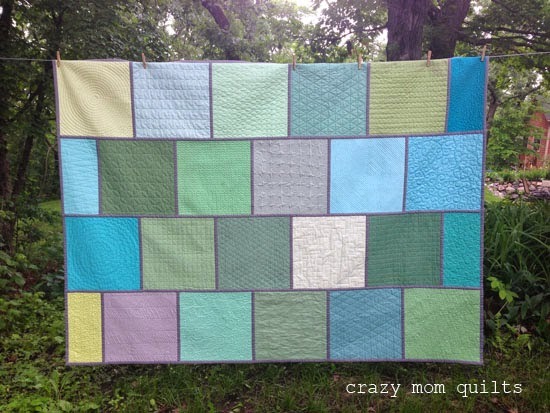 If nothing else, I hope that it gives you a few new ideas for quilting your quilts. If you have any questions, I'll try to answer them in the comments. If you've found something particularly helpful, I'd love to hear that, too! 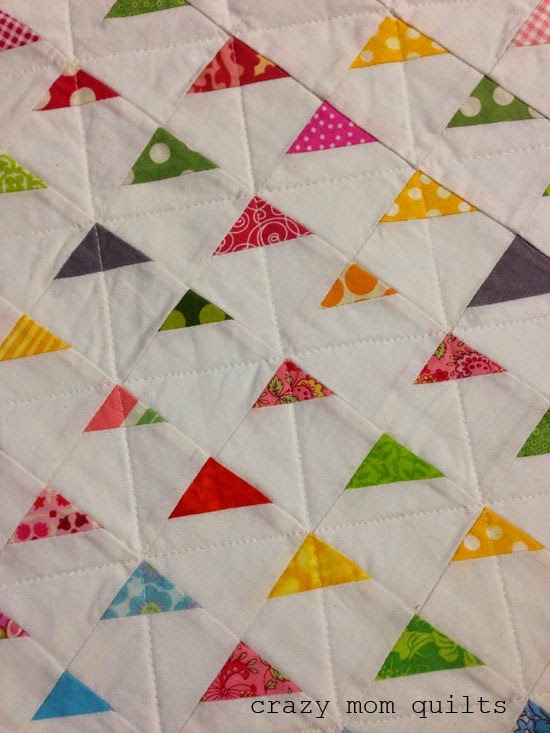 Today we will be talking about assembling quilt tops and I'll share a few quilting ideas, too. Take the 99 blocks you made last week and arrange them into rows 9 across by 11 down. Alternate the direction of the blocks to form a rail fence layout. I take photos as I go along....just to keep tabs on how things are progressing. This was my initial layout. Nearly all the gray diamond fabrics were in the top half of the quilt, so I did a little bit of shuffling. I try not to mess with the layout TOO much, because you can get in over your head and end up rearranging ALL day long. I've done that once or twice! This is my final layout. Sometimes a few simple tweaks help a lot! In each row, I pressed my seams in the direction of least resistance. (See arrows above.) You could press the seams in rows 1, 3, 5, 7, etc. to the right and press the seams in rows 2, 4, 6, 8, etc. to the left. It doesn't really matter how you press, as long as the seams that are meeting nest. When I sew the rows together, I like to work from the bottom up. I press the horizontal seams toward the top. 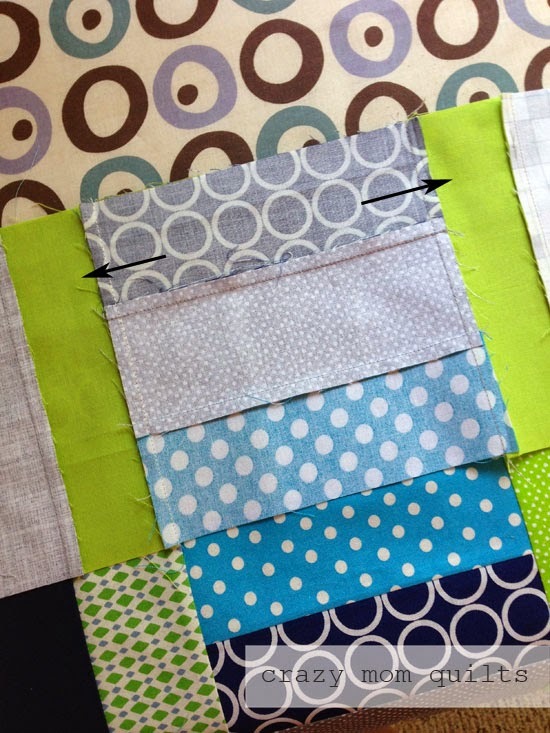 I've found that this is the easiest way to manage the bulk of the quilt as it grows in size. 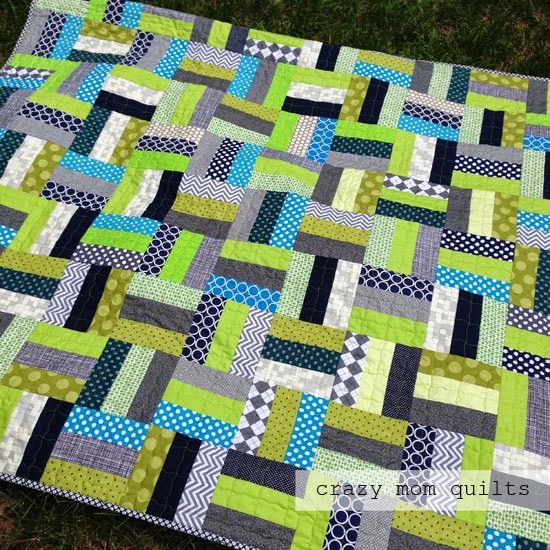 The wavy grid produces a nice texture and it is just the right amount of quilting. Again, it goes QUICK! Gotta love that! On the rockets and robots quilt I did an all over stipple. Or you could do loop-de-loops, which would be quick and fun, too! I used colored threads on both the quilts...these quilts will be going to kids, so the way I see it, the more color the better! Don't be afraid to branch out with different thread colors. It's fun! Alright! That's all I've got for today! 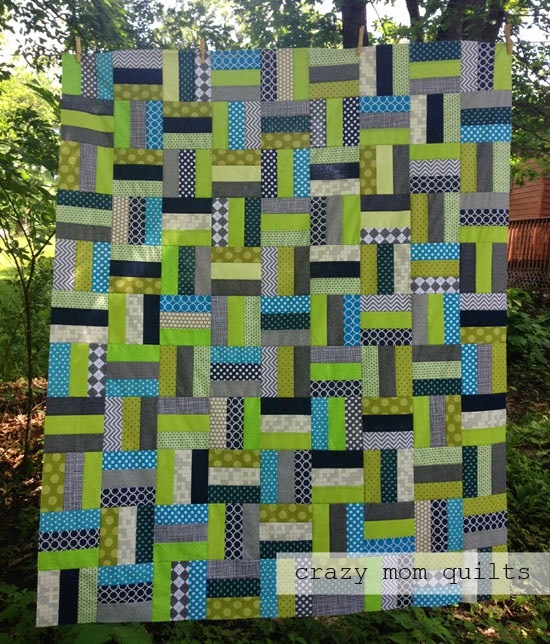 Next week I will have a little link up party so you can show your progress-or your finished quilt! Thanks to all of you who are joining me to make quilts for charity. I really appreciate it! This finish is very exciting to me, mostly because it's been a long time coming (I started this baby in 2011! ), but also because I had to dig deep to find the perseverance to get it done! As much as I wanted to quit some days, I stayed the course and finished it. Hurray! Finishing feels GOOD!!! 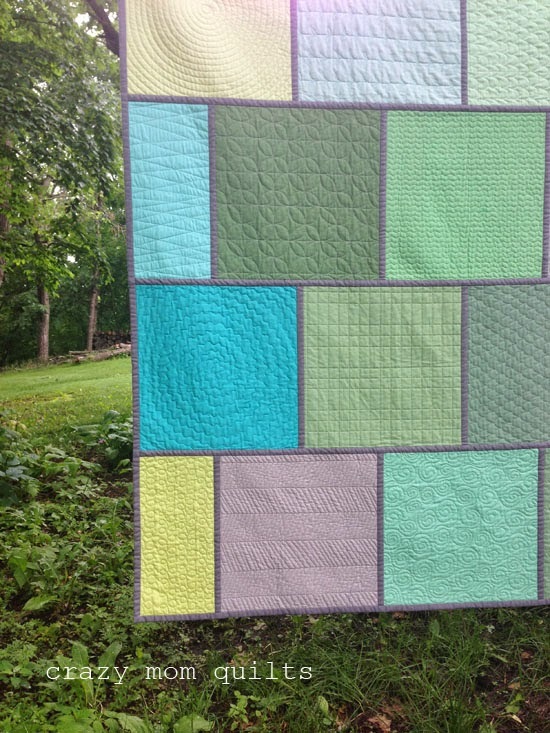 This is a machine quilting sampler, so each block is quilted in a different pattern. 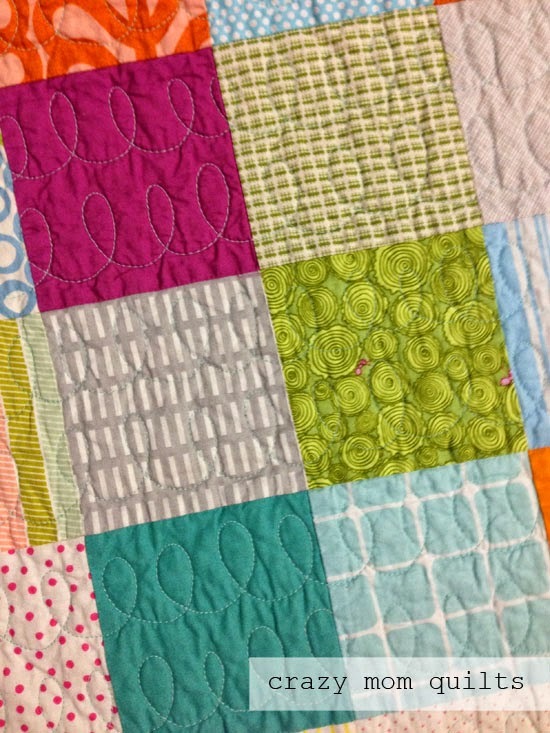 Some blocks are free motion quilted and some are quilted with a walking foot. Between this sampler and my first one, I only repeated one pattern (by accident). Combined, that is 43 unique quilting designs, which was quite a challenge in and of itself! 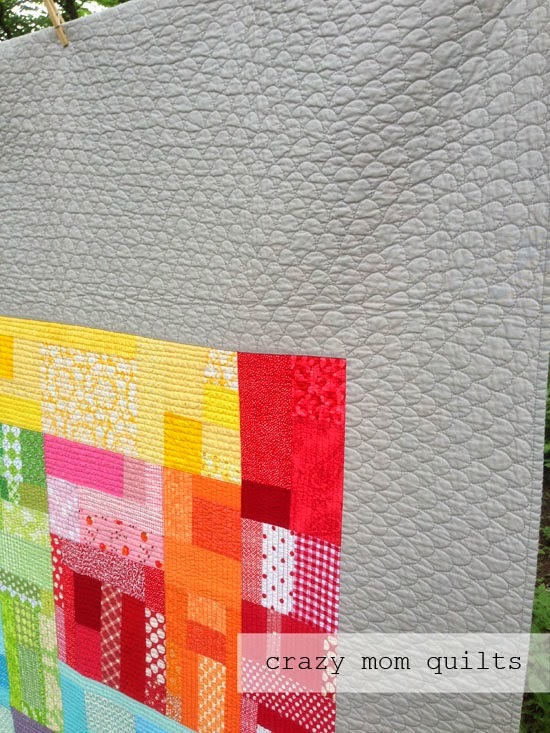 I love the big blocks of solid fabrics because they allow the texture of the quilting to shine. Since this was in progress for nearly 3 years, I noticed QUITE an improvement in my machine quilting skills. That was encouraging! 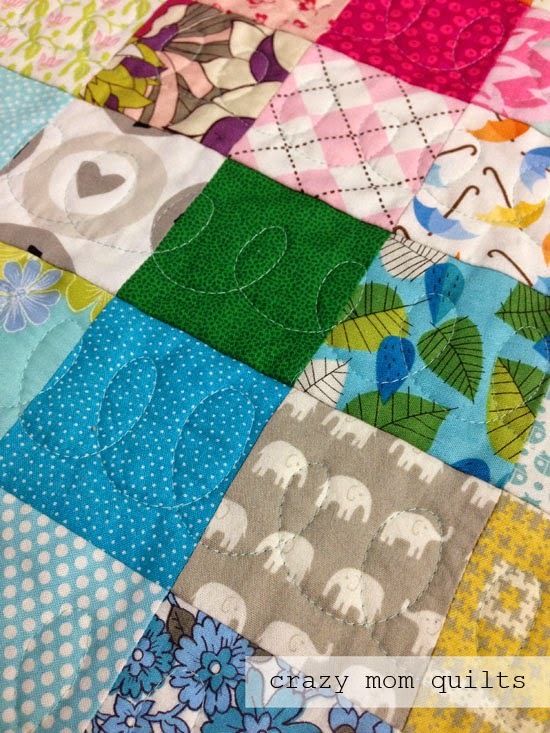 The blocks are joined with a quilt as you go method. It takes some time, because all the seams on the back are finished with hand stitching (!!! ), but it was worth it. I also figured out a way to make the binding wider, so it finishes at 1/2". Matching the width of the binding to the width of the joining strips is a little detail that makes a big difference. Imagine a skinny binding around the outside edge...it just wouldn't be the same. The back is a collection of prints, mostly from Denyse Schmidt's second line for JoAnn's. It feels like a specific date stamp from the past, but in a good way. I love the vintage feel of most of the prints. (Hey. If you are going to do a long term project, pick vintage prints. They will only get better with age. hahahaha!) This would make an excellent picnic quilt...IF I weren't so attached to it! The quilt measures about 64" x 88". 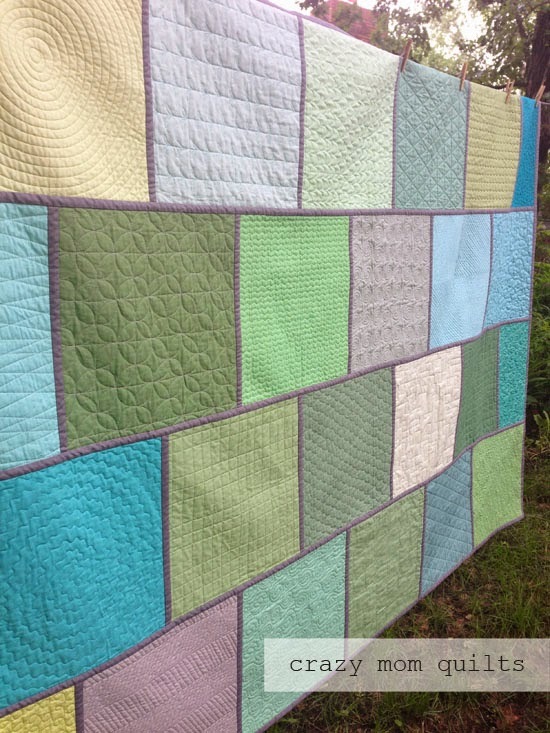 Because I know someone will ask (and many have already asked about this in the past), there is not a pattern or tutorial available for this quilt at this time, because I teach classes based on this quilt. I have thought about turning it into a class or pattern so it would be available on line, but I haven't gotten around to it yet. Maybe someday? I hope so! There JUST aren't enough hours in the day! One more finish to celebrate this week...I updated my bright birch trees pattern and it is now in print! (Available for wholesale orders only at this time. Contact me if you are interested in carrying them in your shop.) I don't know how many hours it takes to get even the most straight forward pattern to this point...but it's a LOT! (Sometimes it's better not to know, or even think about!) But I'm pleased to have it DONE. 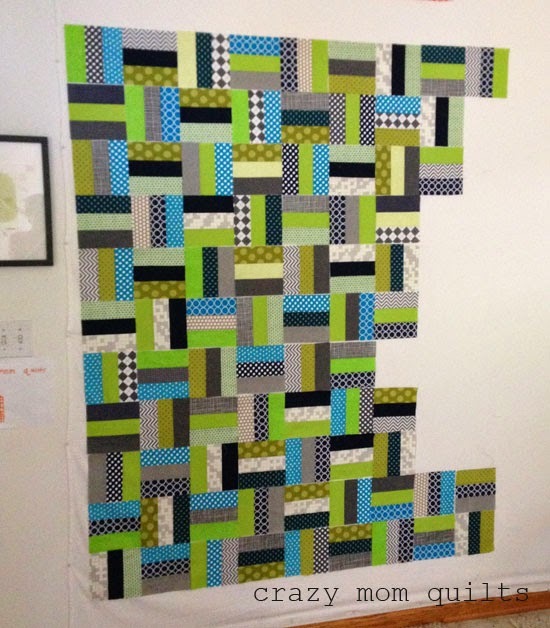 Also, that herringbone quilting is one of my favorites of all time, inspired by this genius quilt by Latifah Saafir. I love it so! Alright, that's all I have for today! Please link up your finishes for the week. Thanks for joining me for finish it up Friday! Have a great weekend! 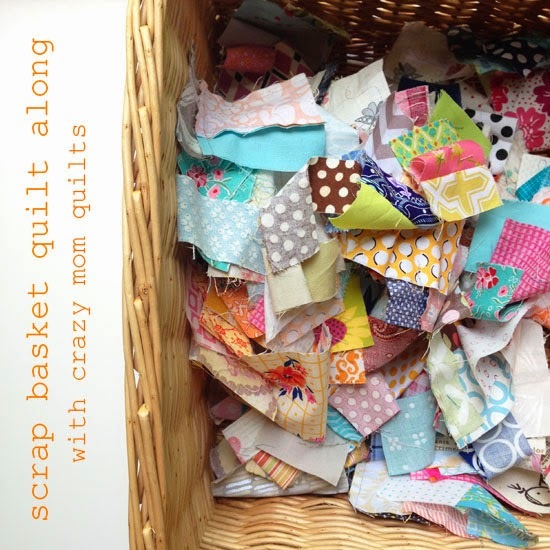 Welcome to week 3 of the Scrap Basket Quilt Along! It's finally cutting and sewing time! 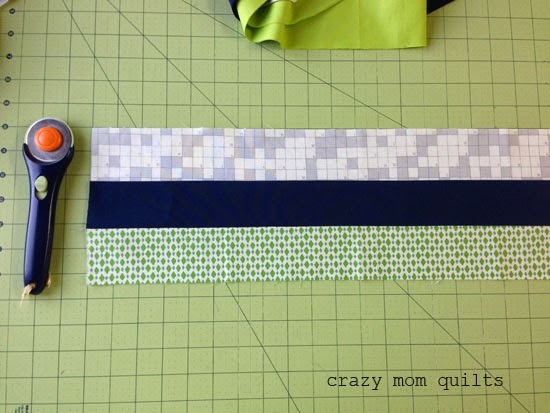 For today's installment of the quilt along, I will show you two simple ways to make a rail fence block. First, gather your fabrics based on the color scheme you chose last week. I've added a few more navy fabrics to my stack and I'm much happier with it. Sometimes you need to tweak as you go along...and that's ok! If you are using yardage, you will need 3.75 yards. Or 15 fat quarters. 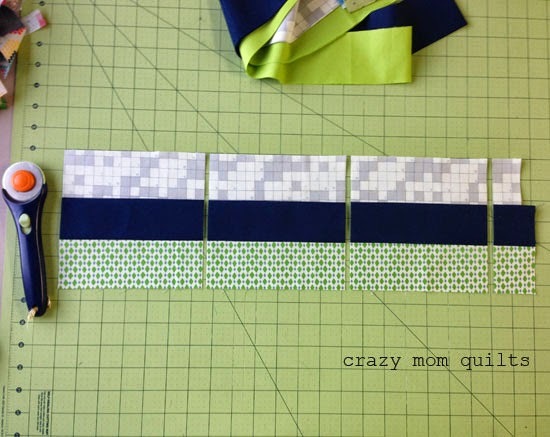 Cut 99 strips 2.5" x 21" from various colors, prints and solids. 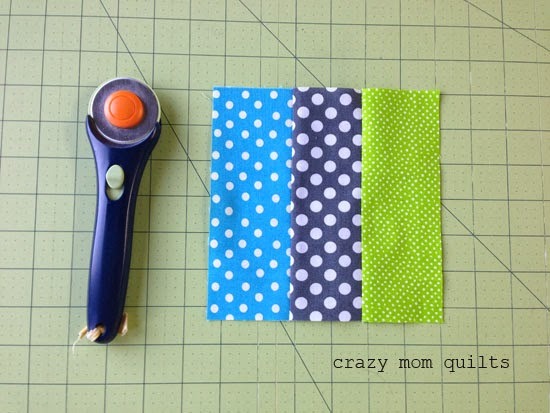 If you are using scraps, cut 297 pieces that measure 2.5" x 6.5". Layout 3 scraps that measure 2.5" x 6.5" each. Sew strips together with a 1/4" seam allowance. Press seams toward the dark fabrics. The block should measure 6.5" square. Make 99 blocks. Layout 3 strips 21" x 2.5". Sew the strips together with a 1/4" seam allowance. Make sure that your stitch length is dialed down, so your stitches are on the short side. 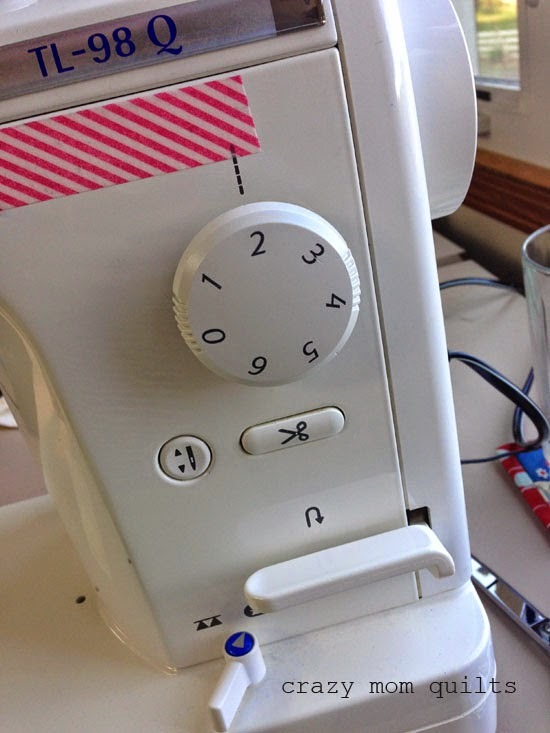 All sewing machines are different, but on my JUKI I have it set on one click less than #2 stitch length. You will be cutting the strip sets apart and if your stitches are too large, the pieces will start to separate during layout and construction. 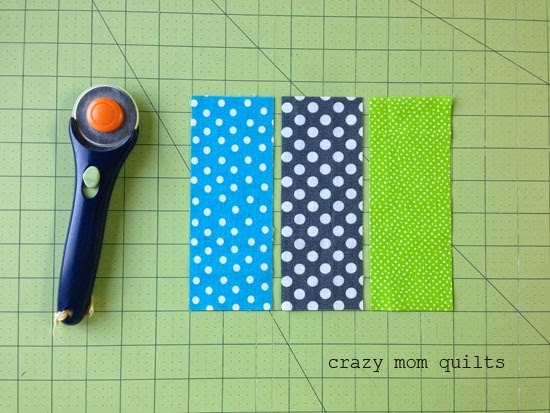 That is the number one reason why I hated strip piecing for years. 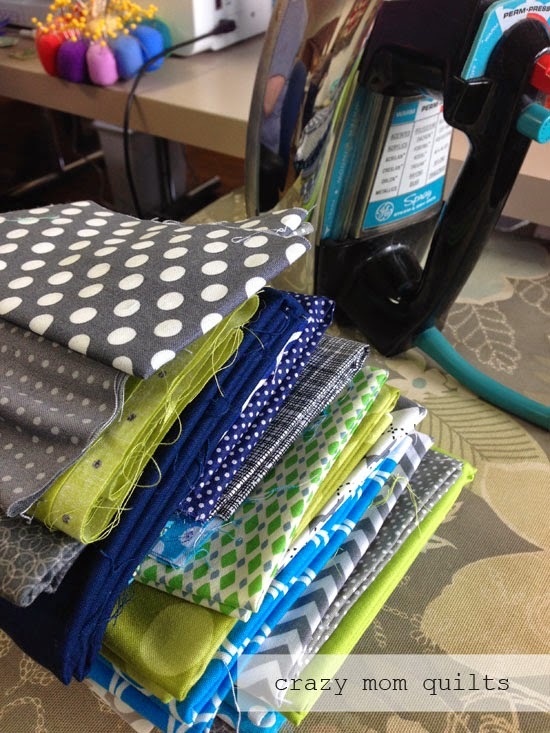 Split seams are a huge pain in the hinder, and they should be avoided at all costs! :) A short stitch length helps a LOT. Press the strip set well. They are prone to curving, so I find it best to hold the strip down on one end (with the iron) and gently tug with the other hand, pulling the strip set taut. Press from left to right. Use a bit of spray starch if desired. Trim the strip set into 3 6.5" squares. Set the scraps aside or discard. Make 33 strip sets. Cut into 99 blocks. 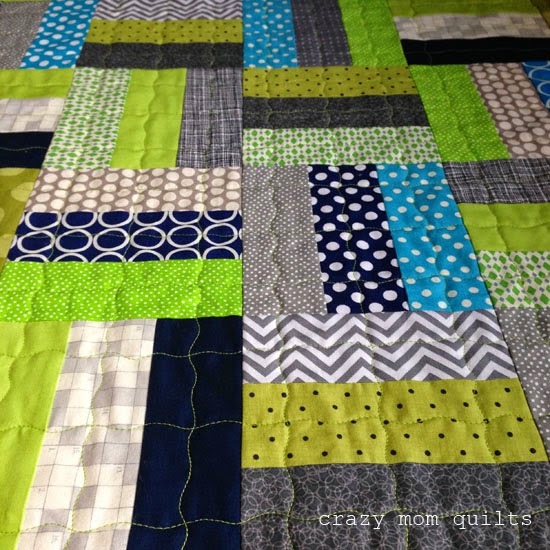 I did a combination of both techniques for my blocks, because I used some yardage and some scraps. Next week we will lay out the quilt and talk about construction and quilting. If you are on a roll and you want to work ahead, the layout is 9 blocks across by 11 blocks down.